The Basics: NV Albee Hill ($16, Non-vintage, but from the 2017 harvest; noted on the back): A roughly equal (10 to 15% each) blend of Idared, Bramley's, Reinette Zabergau and Ellis Bitter, with a bunch of others (at less than 10% each) filling out the last half of the blend. 6.5 grams of sugar/5.1 grams of total acidity/7% alcohol. There were 253 cases produced. I've said it before, but I'm becoming fonder and fonder of still ciders. That's not a knock on the enticing sparklers, but with still ciders I get that full apple-wine experience. They seem more versatile to me in terms of being used as "table" ciders to go with food, too. This could be a nice Loureiro, for instance. The very dry ones—the kind of ciders I like in general—are often better with food when still in my view. 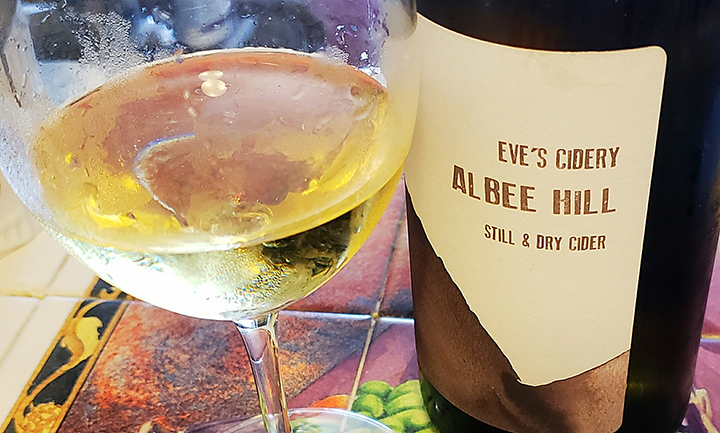 This 2017 is the latest release of a great still example from Eve's Cidery—and a momentous one. After 17 years, starting at a very young age, founder Autumn Stoscheck is going on a sabbatical and working at wineries! Haven't I been telling you that great cideries are like wineries? She'll be participating in Riesling pretty soon. Cidermaker Ezra Sherman is at Eve's for continuity. In the meanwhile, we'll always have the 2017. Poor Autumn. We hardly knew ye. Well, calm down. Autumn is not really going away. She told me that she was mostly going to be managing the Forge vineyard (Pinot Noir and Riesling) in the Finger Lakes and "working on inventing a program to do it organically. But I'll also be going over to St. Cosme at the end of August to make the whites with Louis and of course I'll be part of that making back here in the Finger Lakes come harvest time..." She is committed to wineries through December. "I'm still involved in the cidery, just scaled back what I'm doing to one day per week, mostly admin stuff, though this week I'm supposed to be working on a redesign of our labels for 2017 sparklers...I'm really excited to be taking a needed break, and also for the opportunity to learn new things." Now, for the cider. Cidermaker Sherman says that "Albee Hill is a medley. It makes me think of that evolving orchard." He added that in this still cider, the fruit was their "best of the best," all estate apples. Very dry and a bit tannic, this is still first notable for exuberant fruit and aromatics, that "apples just crushed in front of your eyes" demeanor. As always at Eve's, the fine acidity easily cuts the fruit, giving this plenty of tension and a serious demeanor. Penetrating, tight and completely delicious, this ends in a mouthwatering finish that has a hint of green apple. The low alcohol is a plus, too. You can drink this all day long. It's refreshing, as well. It is a cider you should try, especially if all you've been doing is dabbling in off-dry sparklers. See what the fuss is about in serious, crisp ciders. At the moment, I'm not scoring ciders, but this would get a pretty nice one.